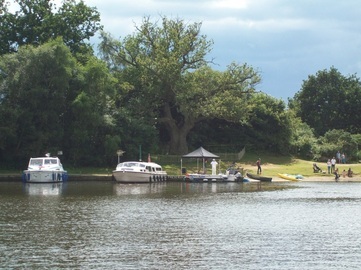 We have five separate mooring areas at Salhouse Broad. Salhouse Broad Moorings 1 and 2: These stern-on moorings are at the eastern end of the Broad. There is a footpath from here to Salhouse village, with local amenities and public transport to Wroxham and Norwich. Rubbish facilities and fresh water are available at these moorings. Salhouse Broad Moorings 3: This is a small, stern-on mooring tucked away at the western end of Salhouse Broad. You can still access the village and rubbish facilities, but there is no fresh water available here. 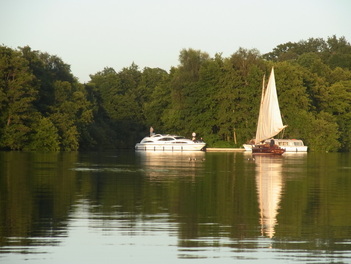 Salhouse Island: side-on moorings between the River Bure and Salhouse Broad. There is no access to land, rubbish or water facilities from these moorings. All prices include drinking water and rubbish facilities. If you use a mooring without direct access to the water pipes or bins, you can head to Moorings 1 or 2 to make use of these either before or after your stay. There is no charge for mudweighting on Salhouse Broad. Moorings inside the Broad, with access to the village.